Living essentials are similar to many of the items you would use at home, although they can be somewhat different for RV use. These camper parts can include kitchen and bathroom items, bedding, and automotive supplies. RV starter kits are a great way to go if you are just starting out in RV’ing, or even if you’ve recently bought a motorhome and want to stock it with new supplies. For example, Camco has starter kits that feature cleaners, power adapters, drinking water hoses, sanitation supplies and other essentials. There are seven different Camco starter kits that can meet your needs. If cooking supplies are what you are after, we also offer starter sets that include cookware, dishes, food storage containers, and many other items to get your kitchen stocked. Essential camper parts can extend to appliances as well. A great example of a basic item you may want to have is a central vacuum system. Dirt Devil offers a central vacuum system that comes with several different attachments to clean almost any surface in your RV, including carpeting, upholstery, and hard floors. You’ll be able to easily clean your RV without giving up valuable storage space with a separate vacuum cleaner. Depending on your camping destination and the time of the year, make sure you have the necessary camper parts to fit your particular situation. If you are traveling during the winter season, water heaters, furnaces, and space heaters need to be in good working order to provide the most comfort. Keep in mind that furnaces evenly distribute the heat throughout the interior, while portable space heaters concentrate the heat in a general area. Also be aware of the available electricity and LP gas supply, especially for running a furnace, which often requires both sources to operate. 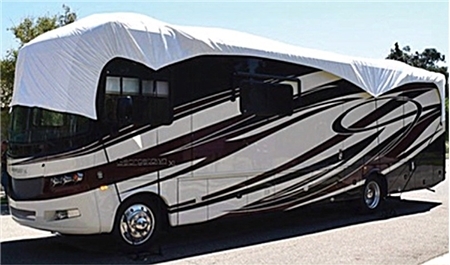 Having the proper insulation for your motorhome will also prevent losing heat, especially through the windows. Bedding may need to be switched out for thicker linens. RV Superbag is one type of RV bedding that includes both a summer side and a winter side. The summer side has half the insulation of the winter side, so switching between the two is as easy as flipping the RV Superbag over. In the summer, you’ll want to create more air circulation to keep things cool. Opening up the windows so you get a little air flowing through the inside is certainly the easiest way. Other options of course include vent fans, ceiling fans, and air conditioners. Vent fans are perfect for boosting air circulation, particularly when you don’t wish to run your air conditioner. They can work with open doors or windows to bring in more fresh air, as well as let out humidity. Make sure your air conditioner is properly maintained to provide the best performance. This includes checking the shroud for cracks, making sure the filter isn’t clogged, and annually cleaning the condenser coil. Be sure to research other camper parts that will make your camping trip more enjoyable. While some of these RV accessories may not be required, they can enhance the overall enjoyment of a camping trip. For example, having a TV antenna or satellite receiver can fulfill your entertainment needs when the weather is rough. Extra kitchen gadgets, such as microwave steamers, ice makers, and countertop extensions will make cooking a more efficient and enjoyable process. Bicycle or motorcycle racks create space for bringing along even more travel options. If you can imagine it improving your RV journey, it’s probably on the market.